Click here for information on how to display your EPub download on iPad, Kindle, Nook, iPhone, Android and Blackberry, plus your desktop browsers. The NCAA association-wide Committee on Women’s Athletics commissioned this report to bring multiple research findings illustrating the status of women as student-athletes, coaches and administrators in NCAA athletics into one document. The mission of the NCAA Committee on Women’s Athletics is to provide leadership and assistance to the association in its efforts to provide equitable opportunities, fair treatment and respect for all women in all aspects of intercollegiate athletics. Toward these ends, the committee shall seek to expand and promote opportunities for female student-athletes, administrators and coaches. The committee shall promote governance, administration and conduct of intercollegiate athletics at the institutional, conference and national levels that are inclusive, fair and accessible to women. The committee shall develop programs and resources, which can be of practical use to the association in its effort to achieve these ends. The NCAA has extensive resources related to gender equity and Title IX. 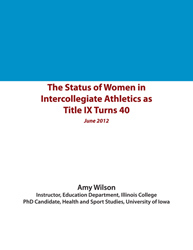 For more information, NCAA members can access those resources at www.ncaa.org/gender_equity and www.ncaa.org/title_ix.